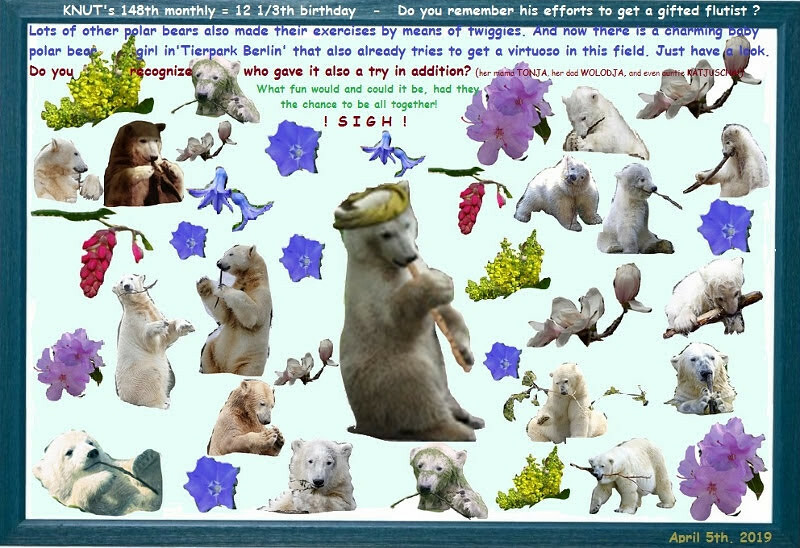 This time I want to show you some photos of Knut enjoying the Spring in the year 2008. In this photo it looks like our bear friend is making plans for the gardening season. Something had to be done to make the enclosure look presentable and cosy! Even the jute sack needed a wash …. 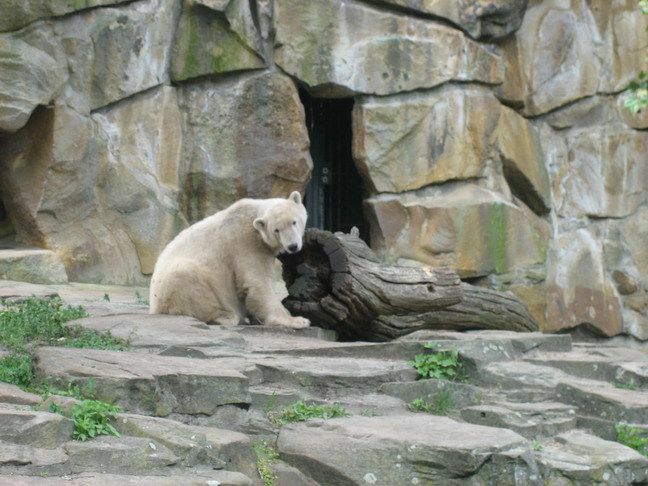 As we all remember Knut really made his enclosure greener by moving plants! Maybe a nice swimming tour after all the work? 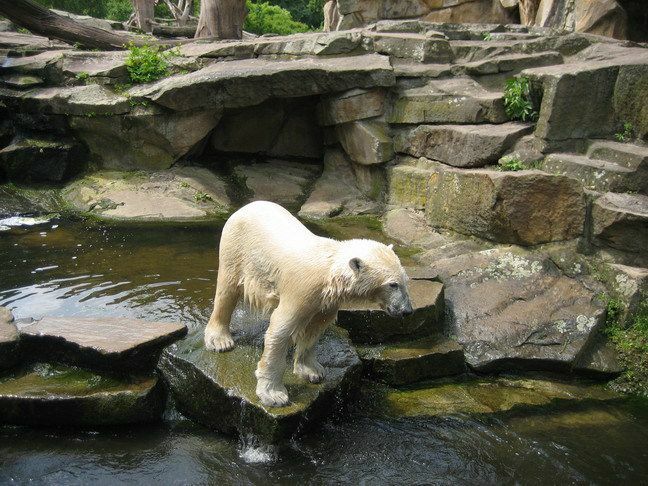 A clean polar bear boy in a clean and green enclosure. Dear Knuti! How I wish you were here to welcome Spring with us even this year! However, your spirit still brings sunshine in our hearts. 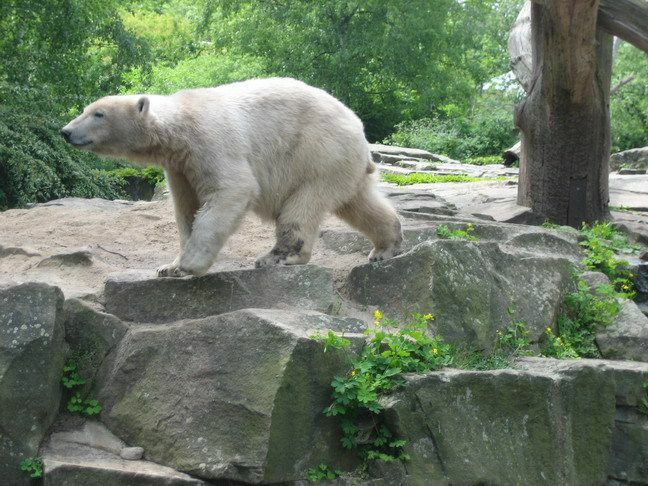 der Knut-Rückblick von 2008 mit Gudruns schönen Fotos erhellt mir gleich am Morgen den Tag. 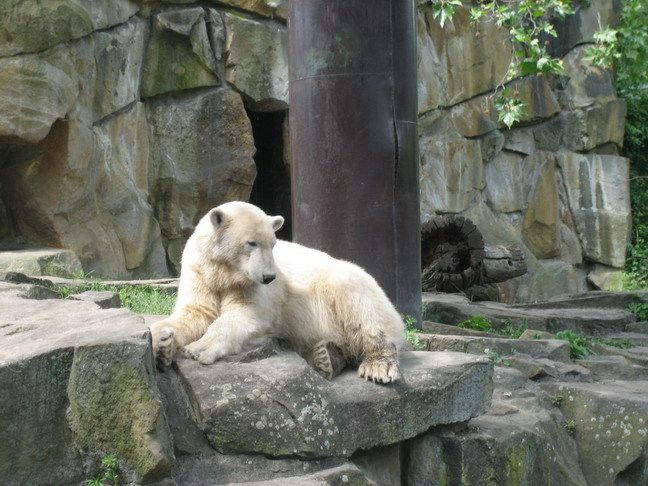 Welch’ einmaliger Eisbär, den ich nie vergessen werde. 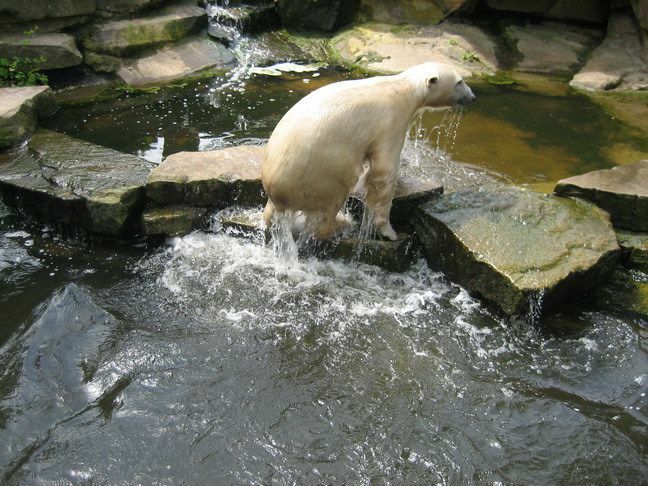 Danke für die schönen Bilder von Knut. Er hat sehr gern mit dem Jutesack gespielt. Thank you for bringing back sweet memories! 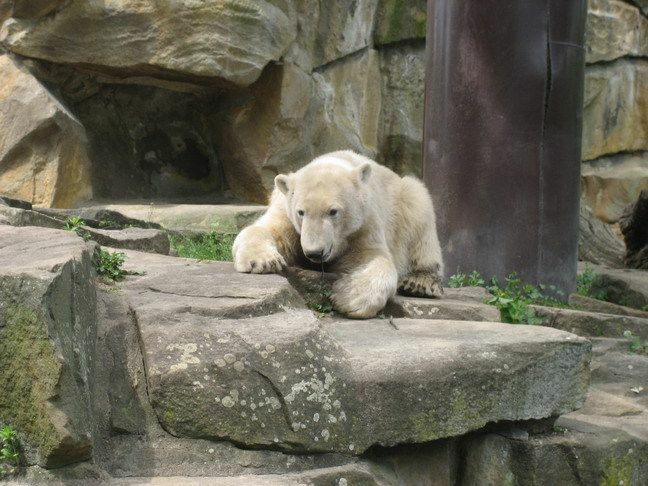 Knut was not only cute and playful with everything he could get between his paws, he was a very talented gardener too. He was keen to create his surroundings to his taste. I loved to see him play and cuddle with different donated jute sacks. In one of my favourite photos of him he is pressing one of these sacks to his chest and leans his head against it. Danke an Gudrun, dass sie ihre schönen Fotos zur Verfügung stellt! Vorliebe für alle möglichen Stöckchen ist legendär. man (der damalige Direktor) ihm vielseitiges Spielzeug verweigert hatte…. 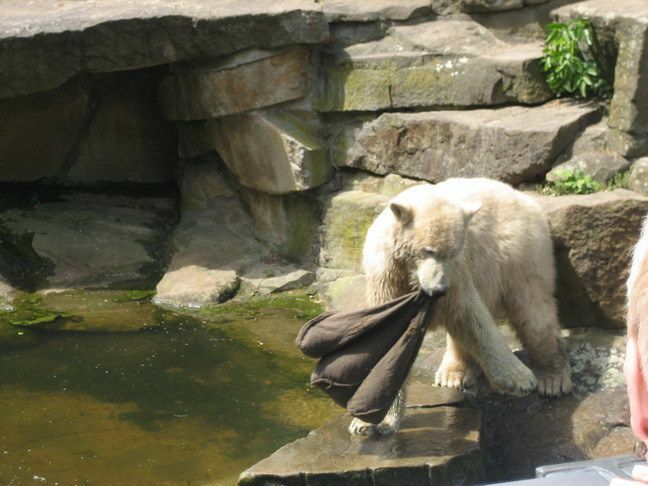 Mein Lieblingsbild von Knut mit dem Jutesack ist das, wo er ihn wie einen Hut trägt. Leider finde ich es nicht auf Anhieb. wieder ein sehr schöner Rückblick aus alten Knut-Zeiten. Schöne Bilder von Gudrun. Die Collage von Dumba ist super. Und ich konnte sogar unsere kleine Prinzessin darauf erkennen. Danke Dumba. 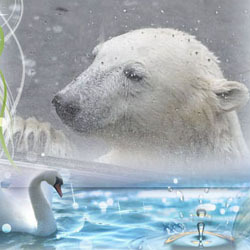 It is another beautiful tribute to Knut. gefunden Sonntag, 7. April 2019 ! ! ! ! I didn’t know this charming video until now – it’s from 2007! Aren’t the ‘AHs’ and ‘OHs’ of the visitors just lovely a n d KNUT – of course – ist ‘zum Anbeißen’!! !